Whatever else 2016 may have brought, it was yet another stellar year for recorded classical music. Once-heard cries of alarm that this corner of the recording industry was in the process of flaming out now seem almost quaint, as boutique and ensemble-owned labels have flourished and downloads and streaming offer virtually any artist access to curious ears. A Classical Notes column from July gathered some noteworthy recordings of local interest; now here is another selection to round out 2016. It may seem strange to begin this survey with a reissue, but this set constitutes such a critical part of Boston musical history that it deserves the placement. 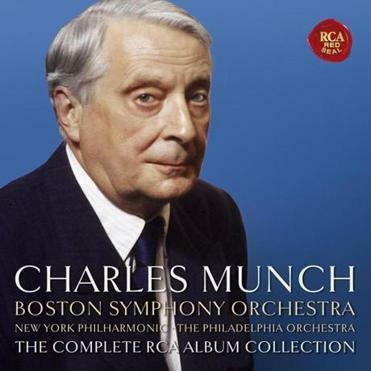 Munch was the Boston Symphony Orchestra’s music director from 1949 to 1962, a period that was not only a golden era in the orchestra’s history but an explosive one for recorded music. His recordings for the RCA label, the vast majority done with the BSO, fill a staggering 86 CDs, among them some available in this medium for the first time. Long recognized for her adventurous musicianship and darkly pure tone, Kashkashian (on the New England Conservatory faculty) here teams with Auerbach, a Russian-born composer and pianist. Auerbach’s transcription of Shostakovich’s 24 Preludes for Piano, Op. 34, gives a coloristic boost to these pieces without sacrificing their enigmatic charm. But it’s the title work, a viola sonata by Auerbach, that’s the real find — urgent and discomfiting, tonally based but withholding any sense of reassurance or centeredness. Though this partnership is new, the two enjoy an affinity similar to that between Kashkashian and her longtime Boston-based pianist, Robert Levin. The country’s preeminent orchestra focused on modern and contemporary music churned out another strong batch of releases on its own label. Among the standouts is “Four Saints in Three Acts,” the famous operatic collaboration between Gertrude Stein and Virgil Thomson. There is no logical reason that the fusion of Stein’s nonsense wordplay, Thomson’s heartland Americana, and the lives of saints both real and imagined should work. But work it does, and the result is a surreal pageant that thrives with imagination and wit, especially in this rhythmically vigorous recording. Hearing the words, all of them, is key to this piece’s success, and Gil Rose, BMOP’s artistic director, manages a performance of musical and dictional clarity that must have been tricky indeed to realize. Also noteworthy is the 50th release on the BMOP/sound label: a collection of orchestral works by Steven Stucky, sometimes referred to as “America’s composer in residence,” who died this year. “American Muse” is a potent reminder of the prodigious talents of a self-effacing composer. The title piece is a starkly powerful setting of John Berryman, e.e. cummings, A.R. Ammons, and Walt Whitman poems. Beautifully sung by Sanford Sylvan, it paints an American landscape that is rugged, honest, and filled with shadows. Kutik, a Russian-born violinist now based in Boston, took the idea for this smartly eclectic release from Hans Christian Andersen’s famous saying that “where words fail, music speaks.” Kutik could plausibly have filled this CD solely with Romantic-era fare, such as the arrangements of Mendelssohn’s “Songs Without Words” and the Adagietto from Mahler’s Fifth Symphony that open it. But he wisely opted to cast a broader net, commissioning works by NEC’s Michael Gandolfi (the lithe “Arioso Doloroso/Estatico” for solo violin) and Timo Andres (the deceptively lyrical “Words Fail”). Works by Prokofiev, Tchaikovsky, Messiaen, and Auerbach complete a recital whose ambitious conception is matched by the precision and intensity of Kutik’s playing. John Novacek is the excellent accompanist on all the violin-and-piano pieces except for “Words Fail,” where the composer himself is at the piano. David Weininger can be reached at globeclassicalnotes@gmail.com. Follow him on Twitter @davidgweininger.